In our work with children and families, we are often supporting them in identifying and healing from trauma. As Case Managers and Peer Partners, understanding and supporting trauma symptoms within your role is of great value. In this training, you will be introduced to best practices within the Trauma Focused Cognitive Behavioral Therapy (TF-CBT) model. TF-CBT is an evidenced-based treatment model for children ages 18 and under who experience symptoms of PTSD. 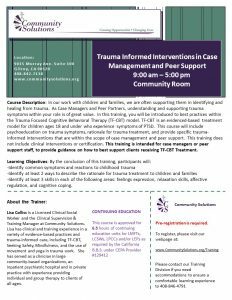 This course will include psychoeducation on trauma symptoms, rationale for trauma treatment, and provide specific trauma-informed interventions that are within the scope of case management and peer support. This training does not include clinical interventions or certification. This training is intended for case managers or peer support staff, to provide guidance on how to best support clients receiving TF-CBT Treatment. -Identify at least 3 skills in each of the following areas: feelings expression, relaxation skills, affective regulation, and cognitive coping.